Most people don’t have dedicated cameras anymore and choose instead to rely on their smartphones. It makes sense, good DSLR are larger and you already take your smartphone with you everywhere, why bother with more? 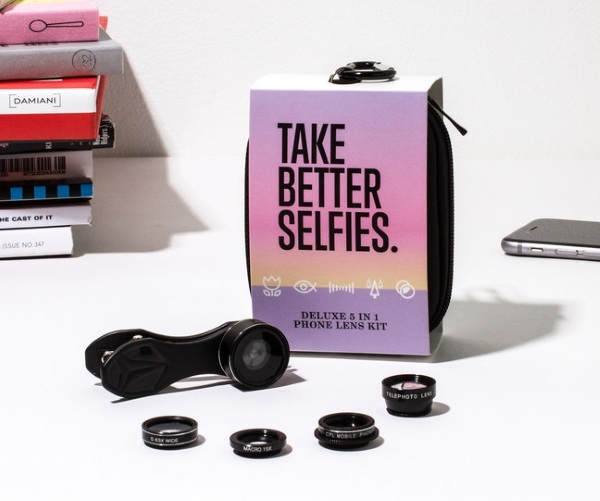 Of course, you can get more out of that pocket camera with a few of the lenses from the Take Better Selfies Lens Kit. This set of five lenses clip on to your phone, over the existing lens. Super easy to attach and start shooting. The lenses included are the basic set of extras: Fish Eye, wide angle, macro, telescopic, and circular polarizing. Although these are advertised as selfie lenses, you can use them for whatever you like to make your pictures more dramatic or be able to capture things on your smartphone that you couldn’t before. Take better pictures of your vacations, outings, model trains or whatever makes you happy. The full set is $19.99.